Most of all are well aware about command line profiling for ASP.NET Application using VSPerfASPNETCmd command line tool . This can easily profile your ASP.NET Web applications which is hosted on IIS. We just need to run VSPerfASPNETCmd command with required parameter. Once profiling done, we can inspect the generated performance report (.vsp) file within Visual Studio. But, do you know we can do the complete profiling within Visual Studio itself. How ? Here you go. While working with ASP.NET web application you must be familiar with one of most important state management technique “Session”. If you want to do a quick refresh or want to know some thing more, please go ahead and read one of my article “Exploring Session in ASP.NET” published at Code Project. In this post I am going to share some important tips that might be useful. While we are talking about state management we consider Session is one of most useful server side state management mechanism for a web application. In ASP.NET mainly we are having two type of state management 1. In Process and 2. Out Process . “In process” is the by default session storage mode for ASP.NET Web application and this is taken care by worker process in IIS. 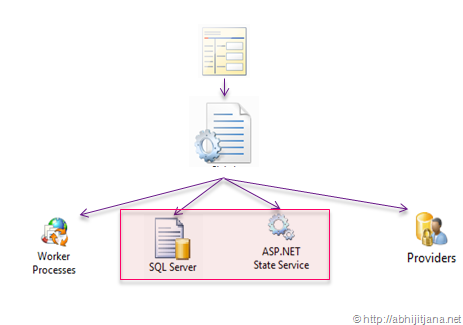 When it comes under Out Process we can use either of state server or SQL Server to persist session data. In case of In Process, session data stored in In memory of worker process. But when we are talking about “OutProc” session mode, we need to ensure that session data should be “Serialized” first . So, when we are moving session data from Web Server to Out Process Server ( State Server or SQL Server ) it can be a performance overhead based on the size of data that we are storing in Session. ASP.NET 4.0 comes with a new option for compressing the Session data with Out Process Session mode. To enabling this functionality we need to add “compressionEnabled=”true” attribute with the SessionMode in web.config . Disabled: Turned of Session Sate for Current Request.